Why Attend a Container Gardening Workshop about Perennials? 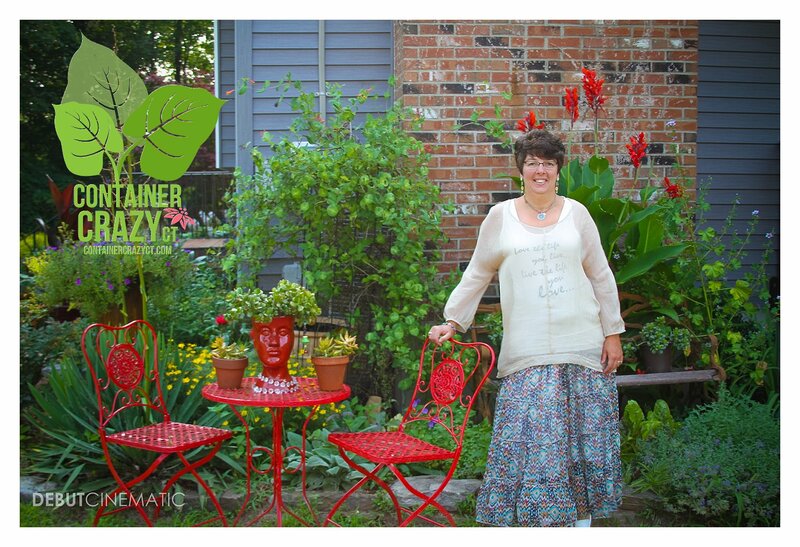 Cathy Testa of Container Crazy CT located in Broad Brook offers a service that brings the plants and education directly to you in one spot on the day of her classes and workshops. The workshops are convenient – You don’t have to travel from store to store to get a great selection of plants – and you get Cathy T’s advice and knowledge as you pick and choose the plants you want to pot up at the workshop. What makes this class different is a lot of effort goes into getting everything ready for just for you – think of Cathy T’s workshops as a personalized class service for you. She hand selects the plants from local reputable growers based on experience of prior use, her classroom is a place you can get dirty and not worry about it or need to clean up after, and it is fun! You also get to chance to meet other plant and garden people local to your area, make new friends, and enjoy a day with no true work on your part. Just think, you show up, plant, learn, and take home your patio pots – there is no need to put away that heavy soil, sweep up the floor, or deal with empty trays to recycle. Delosperma (Ice Plant) cascades over the rim of this pot – A beautiful perennial with drought tolerance and lots of blooms; it is a wonderful filler and spiller in container gardens – and it returns! What are the best perennials to use in container gardens? Maybe you haven’t considered using perennials in pots, maybe you don’t know what they are, or maybe you have. One thing is for sure, Cathy T has used various perennials in container gardens and patio pots over the years due to her experience as a local professional container designer – and she will tell you which have worked and which haven’t – some return easily, some are a little trickier, but either way, she will share with her knowledge of powerful perennials at this class. Perennials offer lots of design benefits from being truly architectural in pots to providing continuous or cycle of blooms. They can be powerful in container gardens, and you will hear about each one available during the Container Gardening Workshop in May and how to capitalize on their features. Tropical plants are part of the workshops too. 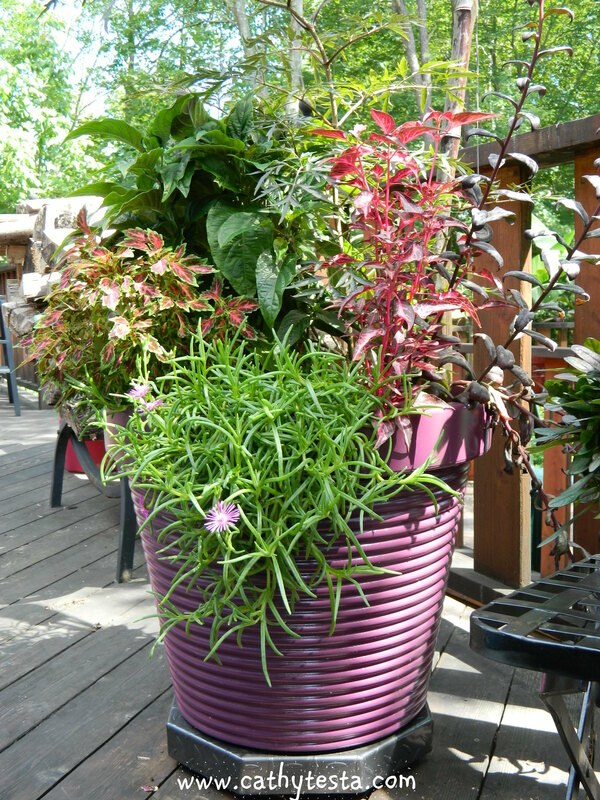 There are ways to reuse perennials and tropical plants in patio pots again and again. You will learn how to grow them, store them, and over winter them for use every year which is covered during the Container Garden Workshops in May. 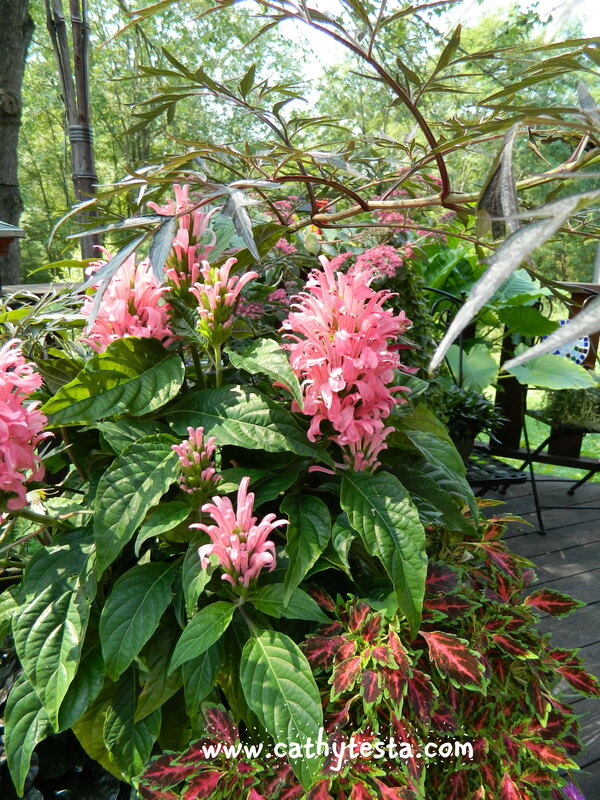 Justicia carnea with pink blooms in a container garden – Attracts hummingbirds and as tropical plant in our CT Zone – It is very showy along side Coleus annual and a hardy shrub above. Ever have trouble getting help when it’s busy? Getting attention and help on your perennial questions is sometimes difficult to obtain when you visit a busy garden center as the doors swing open for spring, especially this year – after our snowy winter and slow warm up of spring, everyone is anxious to get going. By attending Container Crazy CT’s personalized workshop, you get help and attention in a setting that is not over crowded or too busy. It is not everyone that is willing to share their background story on plants or what is going on in the industry – but Cathy T often does at her workshops and classes. Get the inside scoop by signing up for the workshop – and you will learn from the other attendees in class as well because many of them have their own experiences with plants or they may be new attending for the first time and want to learn what you have tried, even as a beginner, or if you are more seasoned – either way, it is an open forum at the classes. Visit ContainerCrazyCT’s special Pinboard highlighting the selected perennials and tropical plants which will be available at ContainerCrazyCT’s May Container Garden Workshops on May 16th and May 23rd. This will give you a preview and some amazing inspiration! Cost: $15 per person plus the cost of plants selected at the workshop (sales tax applicable). You only need to send your registration payment, bring the pots of your choice, and enjoy! Sign-up before the seats are filled, space is limited. ← Container Gardening Workshops in Broad Brook, CT – In Three Weeks! Wish I could be there. For a long time I’ve found that there is a place for perennials in containers. E.G. Hostas in pots under trees don’t have to compete with the tree roots. Good luck on the response to your class.